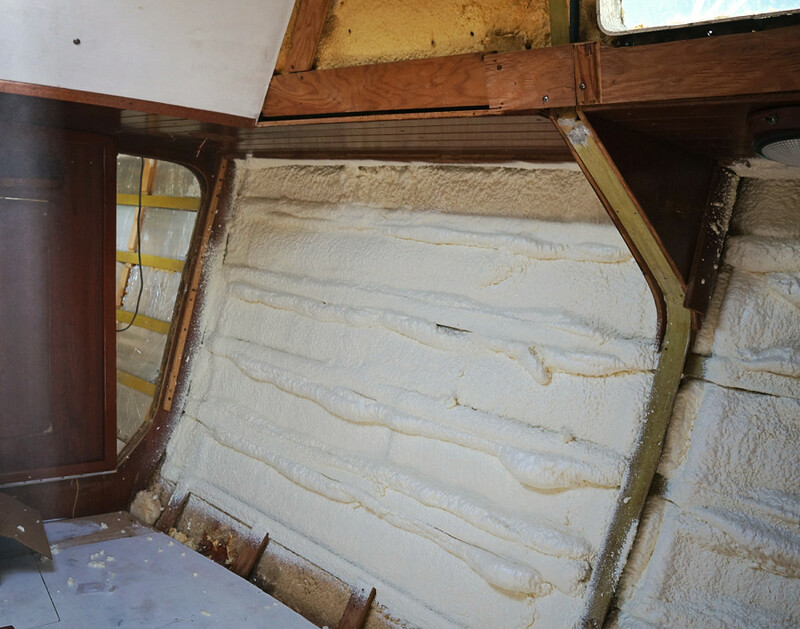 Over the weekend we were able to knock out the project of insulating the v-berth and the forward salon on Daze Off. When we bought the boat this is a project we were not expecting to do, but as anyone knows, plans to rebuild anything is always full of surprises. 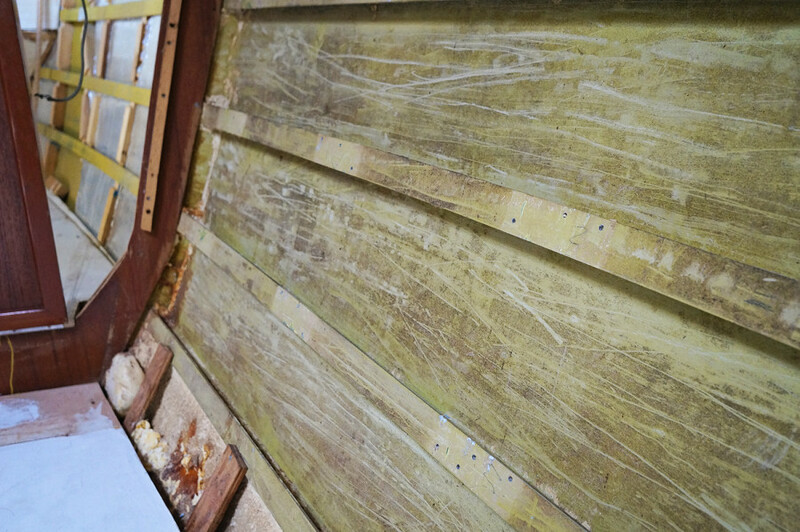 We thought the boat was fully insulated and found out that wasn’t true when we began to rip out the ceiling in the forward salon. All of the insulation there had been removed for what we’re assuming was a place for previous owners to hide drugs. I guess that’s just one of the things you have to deal with when you buy an ex drug running boat. 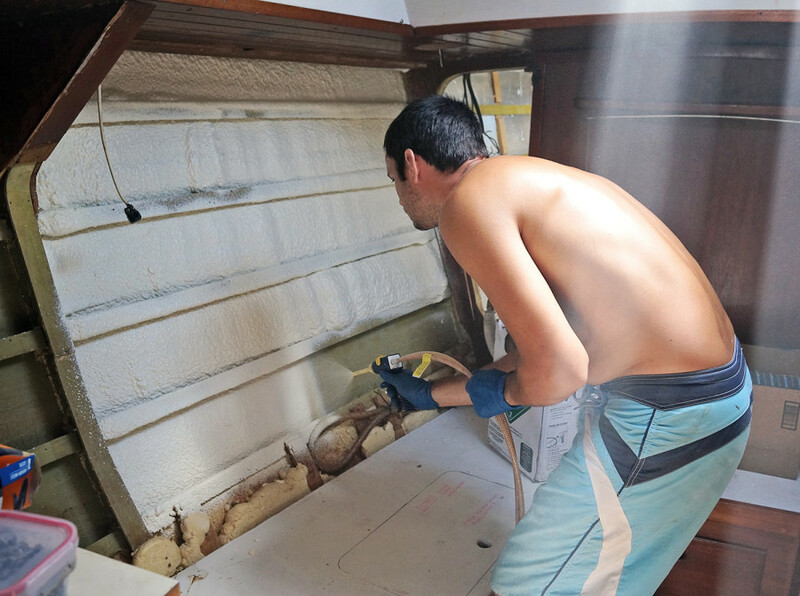 The v-berth did have insulation…but it was only sheet insulation which we don’t quite trust because we wanted to prevent condensation from forming behind the foam and causing eventual corrosion. 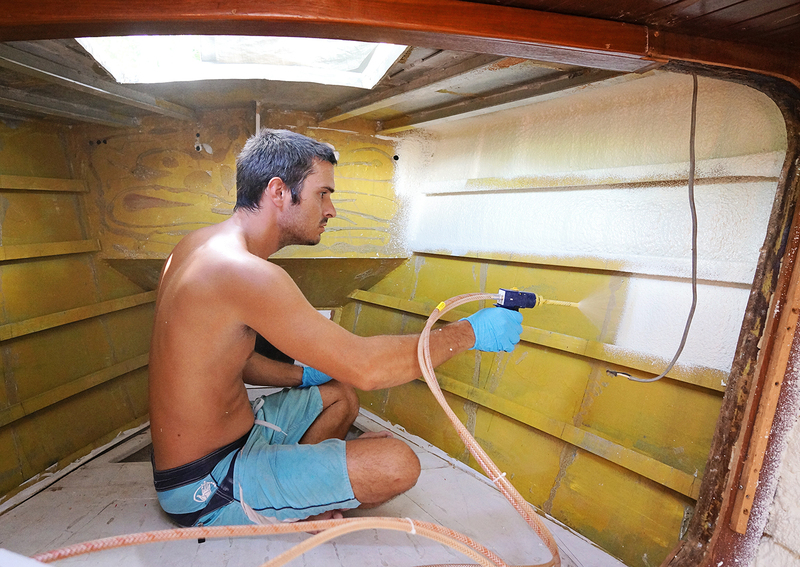 The overhead has spray foam insulation and we’d like to continue that throughout the boat. 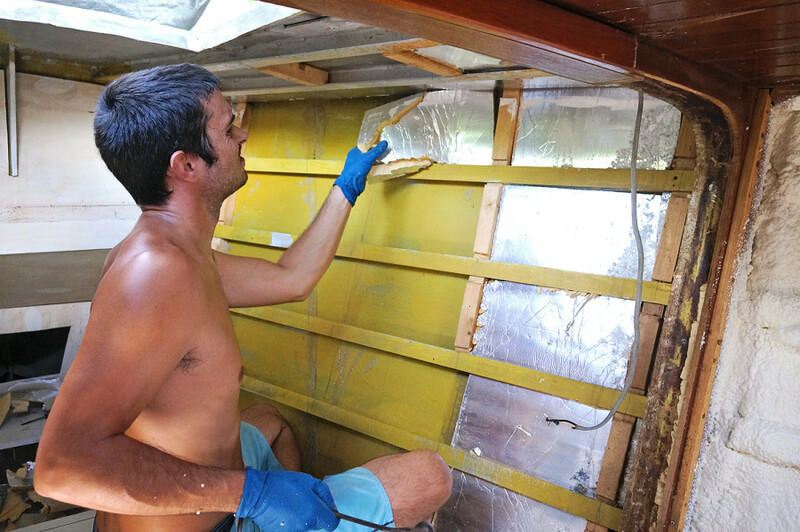 Having had a little experience with doing spray foam insulation ourselves from adding a little extra thickness to the existing insulation of Serendipity’s fridge (which you can read about here), Matt felt confident that he could cover the easily accessible areas of Daze Off himself. Getting down to the primed aluminum hull, all Matt had to do was keep the nozzle 6 inches away from the surface he was covering and squeeze the trigger. We had purchased a two part kit that had everything else ready to go for us. The hoses were already attached to the canisters which means all you have to do is point and shoot. He made sure to go slowly and also went lightly the first time because we didn’t know how much it would expand. We made the mistake with the fridge on Serendipity of spraying too much at first and it expanded so far that we were left with days of chiseling extra out. This foam kit dries in one minute so it was easy to tell right away how much he needed to spray in one area. When the salon was finished and we liked the results we removed the sheet insulation from the v-berth to be able to cover that area as well. Covering the ceiling first we saved the overhead for last and ended up running out of foam. Everything was covered but it wasn’t as thick on the overhead as the other areas. It didn’t quite come out as far as the frames hung down. Even though we’d bought enough foam to cover 200 board feet we ran just short. 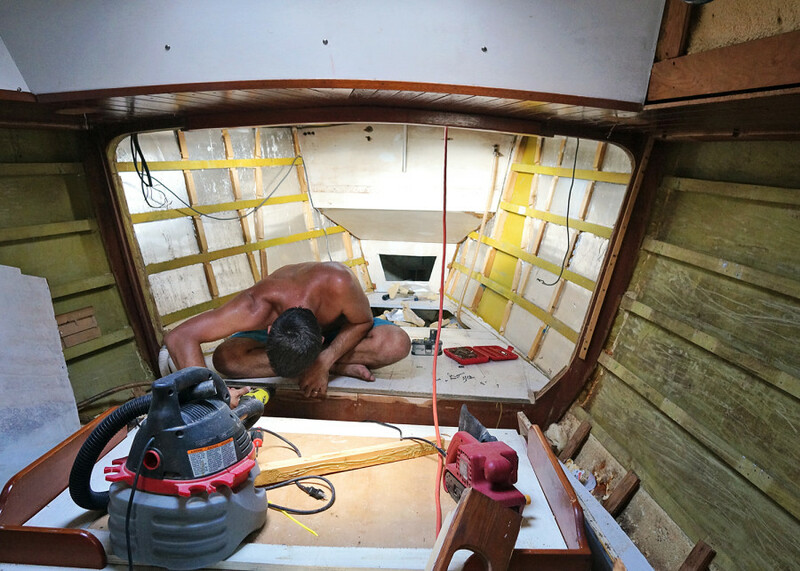 Since we know we’ll eventually have to purchase another kit to cover the head, galley, and probably pilot house, we’ll come back and touch up the overhead of the v-berth. Once the foam had fully dried we had to go back and uncover the frames so we’d still have a place to attach the furring strips to. At first we were dreading the part since we remembered how miserable it was to chip out the extra foam on Serendipity, and then Matt had an idea. Grabbing his Dremmel out he put on a long blade and ran it along the frame. It worked perfectly! With barely any work we were able to cut the foam off cleanly down to the aluminum frame. Switching out this project back and forth since it can get a little tiring on the arms after awhile, we were able to do all the frames in just over an hour. Now we are all set to start putting up furring strips and then the new ceiling! She’s going to look so different with walls in again, I can’t wait to see the progress! *You can spare us the lectures on how Matt wasn’t wearing a mask in this process. We already had a stern talking to after posting a few photos on Facebook. I will say that the kit we ordered is non-toxic and we also had all hatches open and a fan blowing. It didn’t smell the best, but I don’t think we took any years off our lives. The 22nd was Matt’s 33rd birthday, and even though he does not like to celebrate them we kind of forced a small party on him anyway. Mark and Hanna had just gotten back from visiting family and when they found out it was his birthday they said we should all gather at the patio that night for a few drinks. Not that hard since we’re there every night anyway for our dinner. Hanna promised us a new mango drink she’d just invented made using fresh mangoes and an energy drink, and Mark said he’d have all the ingredients handy to make a few mojitos as well. Having a plan of making a big pot of white chicken chili anyway, I invited them to eat with us too. Since Matt still made us put in a full work day, we got down to the patio to shower just after 6 and just in time to watch a very large yacht pulling in the marina. It turns out it was a sunset cruise boat on it’s way down from the Great Lakes to the Gulf Coast and was pulling in for a spot to stay on their transit. When they found out it was Matt’s birthday they invited him on board to snap a few photos behind the bar so we could pretend we had rented it out for his special night, but apparently that didn’t sound as fun to him as it did to me. Finishing up the chili instead we gathered on the patio for dinner and drinks. 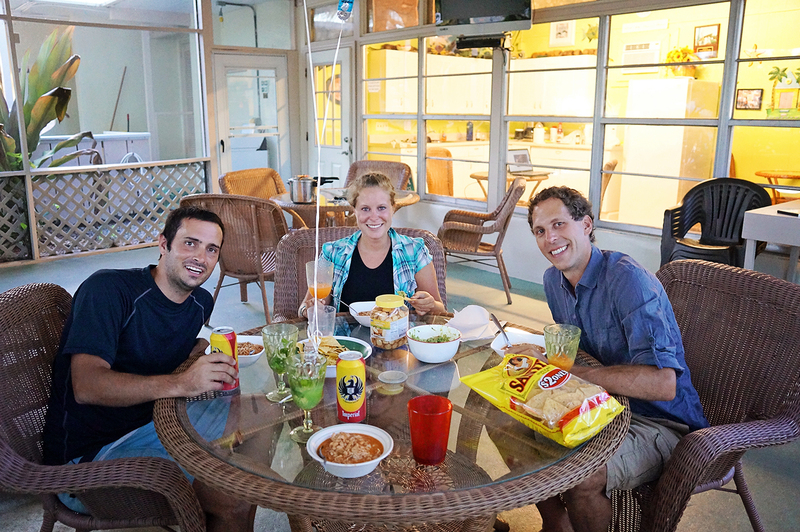 It was a fun and relaxing evening and I think Matt did get to enjoy some birthday antics when one of the yard guys, Alex, came and kidnapped him and Mark for a few hours where they went to a friends house and enjoyed some Coronas and billiards. 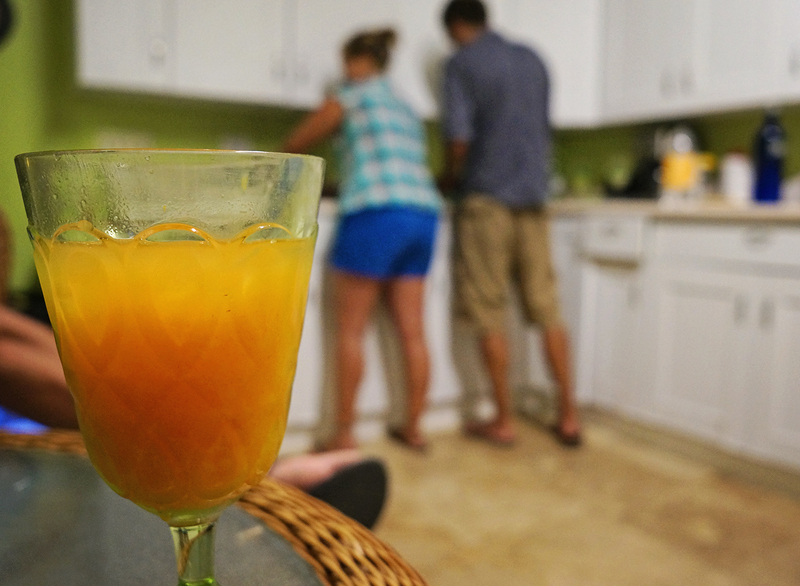 Hanna and I stayed back and mixed a few more mango/vodka/Monster drinks and enjoyed some girl time. Our friends at the marina, Ellen and Scott, had also didn’t know about Matt’s birthday until the day of, so the next afternoon when we came down to the kitchen for lunch we found a bottle of Coca-Cola with a note that said ‘On your birthday you deserve to enjoy the real thing’. A joke since we only buy the cheap $0.84 store brand soda at Walmart. How sweet of them. And funny. I think overall it was a good birthday for Matt, considering we’re in a boat yard. But when my birthday comes…I am getting out. 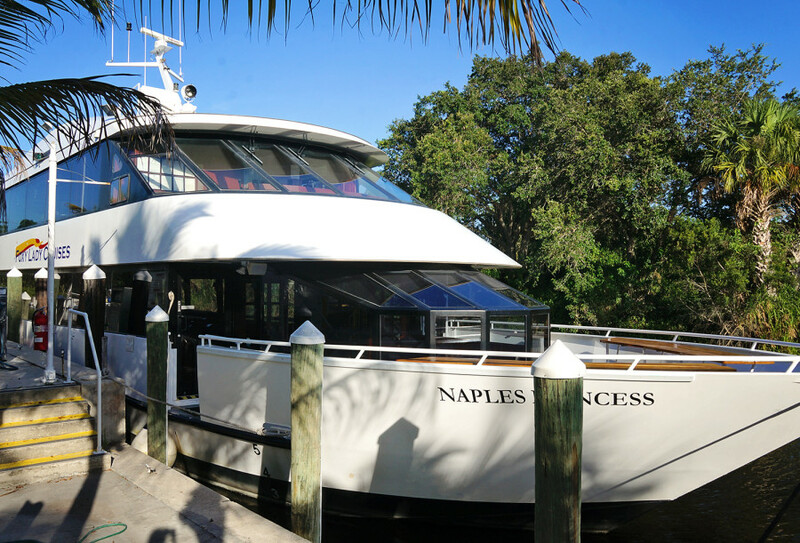 This entry was posted in Boat work - Trisalu 37, Friends, Indiantown, On the hard and tagged birthdays, insulation, spray foam. Bookmark the permalink. The boat is looking great! A couple thoughts. We used the same foam where I used to work, in 500 gallon tanks (hot tub insulation), so you are right about the fumes, there should be no problem with ventilation. You can mask the areas you don’t want foam on, cut along them with a razor, then pull the tape off. What ever you do, do NOT use a hot knife on polyurethane foam, it releases cyanide gas. Be care with flames too. PolyU will burn on it’s own, even though everyone says it will not. You can buy denser (heavier) weights of the foam which offer more insulation in the same thickness, it also expands less so it can be easier to control. Unfortunately, it also costs more. We used the same you are using (1.75#) for 2″ insulation on the spas, 4# (pound) under the footwell, and seats to support the entire weight of the water, and 1.25# for filling roto-molded models between the shell and cabinet. If you need it in some places it also makes a good adhesive. Keep up the great work, you will be in the water in no time! Hi guys, just wanted to let you know that I read your blog daily with great interest. My wife and I are, like many other couples, planning of sailing away for a few years. I’m super impressed with your skill and tenacity to rebuild a boat from almost scratch. Keep going. I am renovating my home and finishing my unfinished basement. The walls have always been the half wall with the wooden framing exposed. I want to insulate and drywall the basement. Am I legally allowed to do the insulation myself, or is it like asbestos removal where I need to hire an expert? I’m honestly not sure what the legality is, all I know is we bought our kit on Ebay and it was very easy to use. That’s really good that you already had some experience using spray insulation. I’m sure I would royally mess that up if I tried to do it myself. Is it fairly easy? Or was there a big learning curve? It was actually quite an easy process, the foam sprayed very well from the hose. Insulation will keep your home warm in the winter and cool in the summer, you and your family will stay comfortable all year round, without having to rely on extra blankets, fans, or other ways to stay happy.